i am just about to put in an order for a set of 16x8 (0 offset) front and 16x8.5 (-6 offset) rear watanabe R's in magnesium centre and polished lips. The reason i am going so large is to fit a set of R34 Skyline GTT disc and calipers on the front (large 4 spot aluminimum calipers, 300mm discs). I chose the particular offset and size as this was one of the 2 recommendations from the watanabe website (the other being in 15") for the KPGC110 GTR, and the GTT came out with 17" wheels standard. To be honest, i have no idea if the 16" will fit, i have the flares to go on the car, but someone also said the GT-R track is wider than the KHGC110. i contacted the agent that is getting them for me, and he is getting a scale drawing with measurements from watanabe for me for both 15 and 16" rims, i will post the info when i get it. Hi mate who is your agent and is the price of $2500 for them landed to your door or without shipping? Also what about import taxes? I'm trying to weigh up some options, would really like Wat's but don't know if they are really worth the price they are looking to cost. Might be better off with some Work wheels in 3 piece. From what I have heard and read the R34&Z33 brakes will NOT fit in a 15" wheel. However the slightly smaller Z32/R32 4piston calipers and brakes WILL FIT. There was a detailed thread about this on the Z email group just recently... Someone compared Z32/R32 to the newer R34/Z33 and pointed out the differences. I've saved the email and would love to copy and paste it here right now but my work firewall makes it impossible to access my hotmail account. Can you wait until later tonight for that info? Several of the Japanese tuner stores for our cars sell CNC brackets for adapting the Z32/R32 calipers to our stock uprights and use off the shelf rotors from other cars. 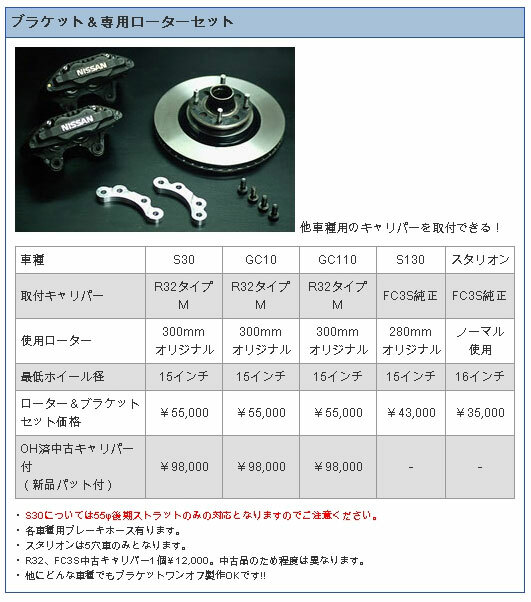 If this doesn't spell it all out... what rotors to use, what size wheels, etc..
don't suppose you can email them to find out if they have/can do an adaptor for the R34 GTT calipers on the GC110? Just a heads-up: GRIT are in Kawaguchi ( Saitama prefecture ) - not Yokohama ( Kanagawa prefecture ). > >There's a misconception about the Skyline brakes. > >The Z32 and the Skyline R30-31 shared the same brakes. > >did not come cross-drilled from the factory. >differs in being a floating type. >units, but thinner to accommodate a 22mm disc instead of a 30mm disc. >www.dba.com.au & download the Nissan Catalogue. Both Yokohama area and Saitama ken are happy hunting grounds for parts, aren't they? But that's the fun part isn't it? Most of the Kanto area - Tokyo, Saitama, Kanagagwa are good hunting grounds for parts, parts shops, and tuning shops. Sometimes, at seemingly bargain prices! But they tell me that the cars are best found in the southern (Kagoshima, Osaka) and northern (Aomori, Misawa) areas. I guess in the countryside you have the space to keep an old car storaged in an enclosed garage. btw.. does anybody here happen to know how Holden Commodore VT, VU, VZ etc. handrake cables work? i am looking at using the rear calipers, but the pics i have found don't seem to have any provisions for a handbrake cable. Commodores (VN onwards i think) have like a seperate drum brake inside the disk hub part that is used soley for the handbrake, none of this stupid caliper business! EA or so Falcons and early 90s Hondas handbrake's were activated via the caliper. interesting, anyone heard of doing it this way on a conversion on a datsun (maybe 1600 with 240k arms?)? when i spoke to SWR about doing the rear conversion for me, they indicated it was a VT commodore rear setup (to suite my GTT fronts), i found that on ebay i can get the disk, caliper and pad set for $150, so i am thinking i might have a go myself, just not sure about the handbrake setup.. i guess that means i need a backing plate too?